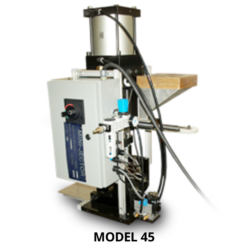 Mini-Jector models 45 and 50 are mini injection molding machines ideal for low run, prototyping, and cable overmolding applications. Both of these models are simple plunger-style machines, which restricts the type of plastic they may use, but greatly reduces their cost. 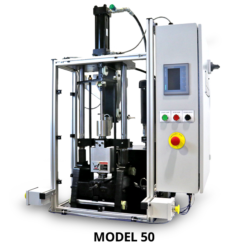 The Model 45 is a pneumatic vertical injection molding machine that can be either 110VAC or 220VAC. 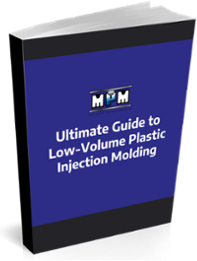 The Model 50 is a hydraulic vertical injection molding that utilizes 230VAC. What Can Models 45 and 50 Do? Mini-Jector machines use mechanical advantage to generate a large clamping force (12 tons) with only a small amount of inputted effort. This force is maintained through the injection cycle. 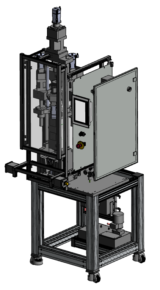 The Mini-Jector Models 45 and 50 each use a single hydraulic cylinder for both clamping, carriage, and injection duties, therefore reducing the cost of manufacture. Do You Have a Question About the Model 45 and 50 Product Specifications or Capabilities? Contact Us!